A fantastic experience to say the least. We cannot say enough about, Jeff & Glen Davey. The Davey family and their staff were a pleasure to meet and deal with. 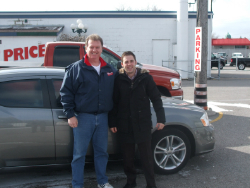 We strongly feel that we have established a new friendship and as far as we’re concerned,any and all of our future vehicle purchase considerations, will be made first, at Davey Auto Sales.